The Tropical Wave #7 is passing by the island today and probably tomorrow also. It is just going to be some rain, wind, lightning and thunder and some choppy seas. All fine. At least it was not a hurricane. Well, Teli, The Dominican Dog, and I went out for her walk. I really did not want to go out. I just wanted today to be one of those all-day-in-the-house-days. But, the baby doggie needs to go out so I obliged and did my motherly duty. She gets nervous about all sorts of things. Tonight she was nervous because the leaves in the trees were rustling a bit too much and there was a wind. She took care of her business and we headed to the Colmado where she always feels safe. The neighbors were there hanging out, mostly outside. Then the rain started. It came down hard and fast. They all came inside carrying their drinks and chairs. Manuela, a friend that is not Dominican, was sticking her toes out the door getting them wet. I always wanted to run in the rain, just like we did when I was a kid. 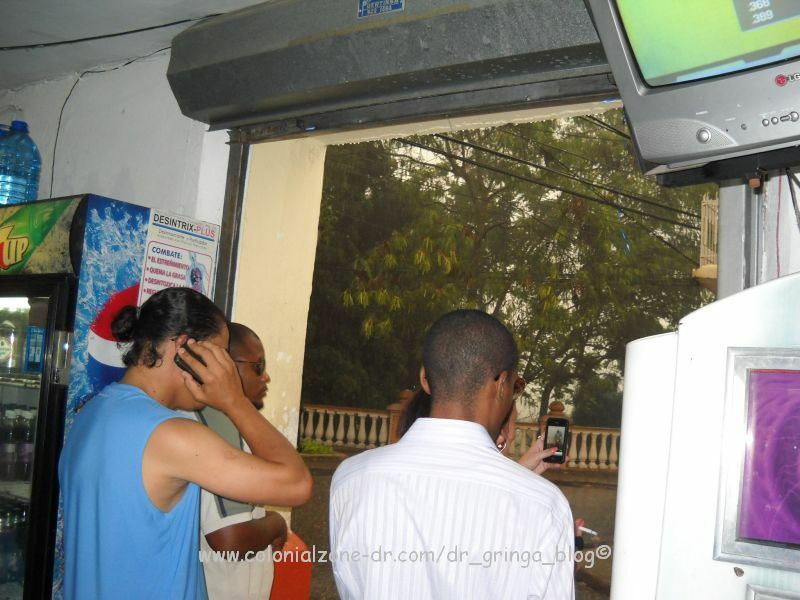 Dominicans, the adult type, usually do not like to get wet, so there is not much rain running gong on other than the kids. Well, I asked Manuela if she wanted to run in the rain. She said YES! We emptied our pockets of all electronic equipment to stash behind the counter and we were off! We were soaked. The best part was getting under the heavy streaming water coming out of the houses roof pipes. They gave a great back massage. I thought that maybe others would see that it was fun and join in but nooo..they all watched the two crazy non-Dominican crazy ladies playing in the rain. Teli would not go in the rain either. She just watched like everyone else in the place. Manuela and Janette, The Dominican Gringa, all wet after playing in the rain. The rain stopped and it was time to go home. Teli and I were walking down the street back home and POWWW! Something electric exploded! About 8 paces behind us! I do not know exactly what either of us did the exact moment. I remember ducking. Teli pulled on the leash and then came up next to me. For a second I thought it was a gun. The second it happened a car alarm went off adding to the noise. All the neighbors came out to the street to see what happened. I just pointed. I did not have the Spanish words to explain. Teli was so interesting. She never pulled on the leash like she usually does. She walked home so nice. Right by my side. She was so good. I thought maybe she was in shock. I checked her a few times but she seems to be fine. Anyhow, now all is calm. I am home, where I never wanted to leave today. Got a free shower. Got more Dominicans to think the Gringa is crazy. Almost got electrocuted by a blown out electric something or other. And all I wanted to do was stay in the house. One never knows what might happen when one leaves the confines of their own home to venture out inwalk, to the Dominican streets. I love it! Wowwee's crazy, dominican dog, fun, playing in the rain, rain, storm, teli, wet. permalink.